You've probably heard the stories of Albert Einstein and his delayed language development (he didn't speak until he was three) or the idea that his teachers in school thought he was "simple minded." Perhaps you've read about Bill Gate's autism-like behaviors, or Thomas Edison's inability to read until he was 12 years old. Sound familiar? We know these stories of people who are widely recognized for genius in their fields, and yet they also had learning difficulties as well. We've used these famous people in our lessons to coach students about grit and perseverance, we teach them about how individuals like this overcame sometimes tremendous difficulties in their lives to become preeminent experts in science and technology. 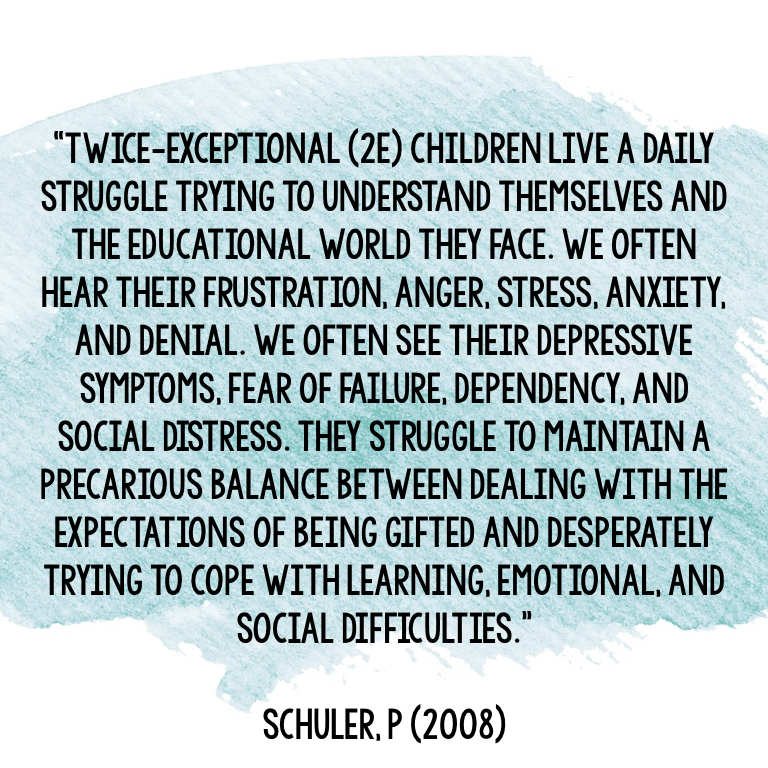 And yet, when it comes to the children in our classrooms, identifying students who are both gifted and facing some sort of hurdle when it comes to learning--whether it's a physical, sensory, emotional/behavioral, or specific learning disability--is something that is quite often overlooked. 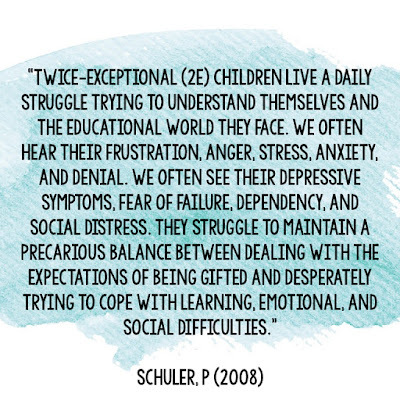 It's easy to see why these students are not always readily identified--they're dealing with a very complex set of strengths and weaknesses, many of which can be hidden or masked by a child's strengths (ADHD, Autism Spectrum Disorder, learning disabilities). Not to mention the fact that our parenting classes and teacher-training programs were not likely to spend much time training us on how to recognize these children. It is important that we learn how to identify and support these children because while they may seem to have developed strategies for compensating in one area or another, they still need the support of parents and teachers alike. They need our help so that they can have access to strategies, tools, and programs that will help them meet their full potential. Who are these special people? Children whose learning and attention issues are masked by their giftedness. These children are likely to have been identified as gifted as they generally perform well on tests for giftedness, but they may not do well in gifted programs. People may look at them as being lazy or underachievers when they don't perform as well as their gifted peers. Children whose learning and attention issues mask their giftedness. These children are less likely to have been identified as gifted because they don't perform well on the gifted identification tests. Further, because they are sometimes placed in resource rooms or receive other services for their disability, they may become bored, act out, and are more likely to be labeled as a behavior problem. Children whose giftedness and learning disabilities have masked each other. These students are likely to appear as fairly average or slightly below average in the classroom setting. Their abilities and disabilities have an effect of canceling each other out, making them quite difficult to identify for both their giftedness and their potential learning difficulty or disability. What are the signs should we be looking for? Gifted children who are placed in remedial classes may feel like they don't fit in with their special education peers, and likewise, may have difficulty relating to the children in gifted classes. Having the knowledge of how to solve complex problems or create sophisticated stories but lacking the fine motor or processing skills to actually get solutions or stories on paper can be extremely frustrating for children dealing with their exceptionalities. They might crave perfection or independence, but struggle to attain either. They may have a hard time getting their brain or their body (or BOTH) to cooperate, leading to anxiety and sadness. Dealing with the daily discrepancies in thinking and functioning with a body or brain that doesn't seem to cooperate can lead to decreased confidence and persistence. Over time, children can start feeling hopeless, sometimes becoming depressed. A child's full potential may never be realized if the sole focus of their instruction and learning is only in deficit areas. The child's giftedness must also be addressed, and their gifted strengths can be employed as a tool for helping deal with the disability. As you can see, learning how to identify gifted learners with disabilities is extremely important. Once we determine what the child's needs are, there are many tools and strategies teachers and parents can use to help them overcome their learning difficulties. Stay tuned--my next post will focus on how we can advocate and work toward meeting the needs of children with dual exceptionalities in the classroom. Do you have a student in your classroom or child at home whom you suspect may be 2E? What signs are you seeing that have you questioning the possibility? Leave a comment below--maybe another reader or I can help. *Baum, S., & Owen, S. (2003). To be gifted and learning disabled: Strategies for helping bright students with LD, ADHD, and more. Mansfield Center, CT: Creative Learning Press. This a fantastic post! So many times our 2E kids are overlooked! Thank you so much! It's easy to see why they don't always pop up quickly on our teacher radars, but I hope we will start recognizing the signs better! 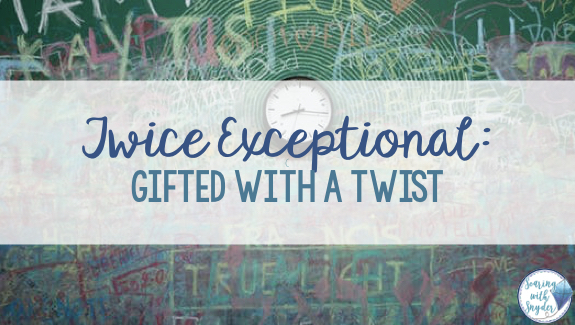 I’m Jen and I am passionate about helping hardworking teachers find creative ways to meet the diverse needs of the gifted students in their classrooms. Click on the "About" tab at the top of the page to learn more! Join our Facebook teacher group! Sign up here to join my email list where you'll get occasional emails from me with fresh ideas, tips, and tricks about teaching gifted children, PLUS you'll gain access to my free VIP resource library.